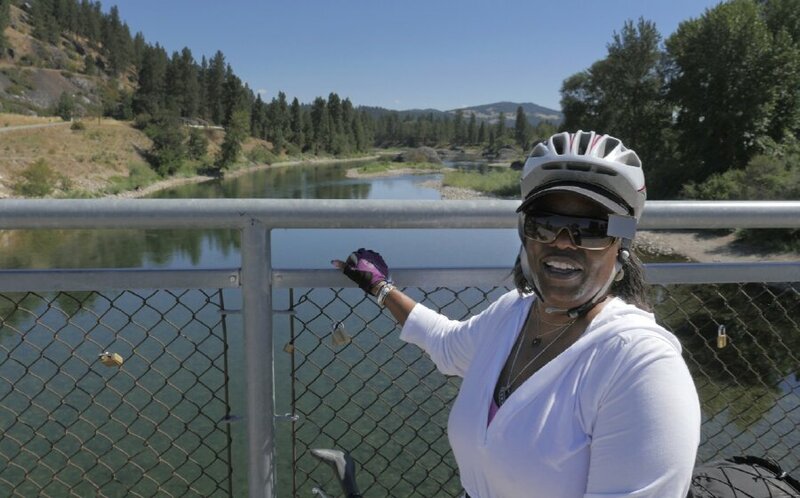 We were shocked when we first discovered the beautiful bike paths that existed in the Idaho panhandle. Join us as we cycle on rail trails free of motorized traffic through pine forests, along rivers, and around mountains. Some of the views are breathtaking! 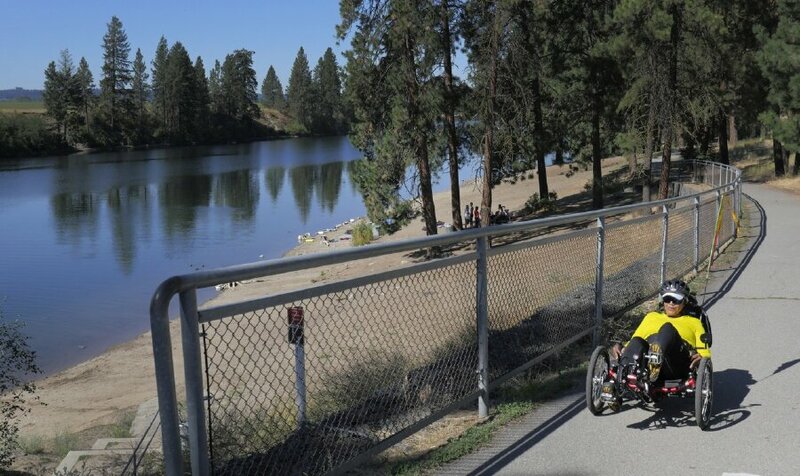 Flat terrain on nearly all bike paths closed to motorized traffic. Leisurely cycling level. 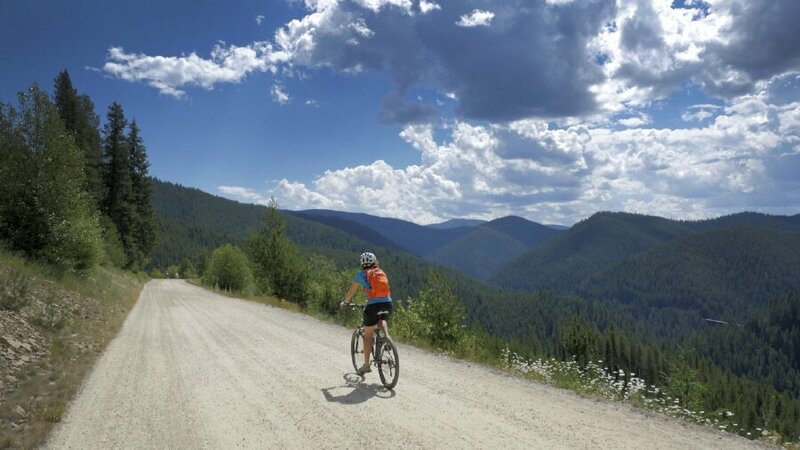 5 nights lodging, 5 breakfasts, 3 picnic or sack lunches, 4 dinners, snacks, bicycle workshop, use of mountain bike for last day of cycling on unpaved rail trail, cue sheets, van support and trained guides. $195 for hybrid or road rental bike. Fly or take the train to Spokane, WA. Take the hotel’s complimentary shuttle service from the airport or train station to the tour start. Or drive and leave your car at our starting hotel for the week. WomanTours will shuttle everyone back to Spokane at the end of the tour by 10:30am. 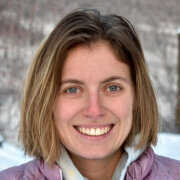 "I was a true neophyte and had no idea what to expect. What a wonderful experience, empowering and energizing! I was especially “wowed” by the condos at Kellogg. Very first class." DAY 1: We begin our tour at a hotel nestled on the banks of the Spokane River. We’ll meet at 3:00pm for a rental bike fitting and 5:00pm for an orientation followed by dinner. If you arrive early, take a dip in the hotel pool or soak in the hot tub. 0 miles. 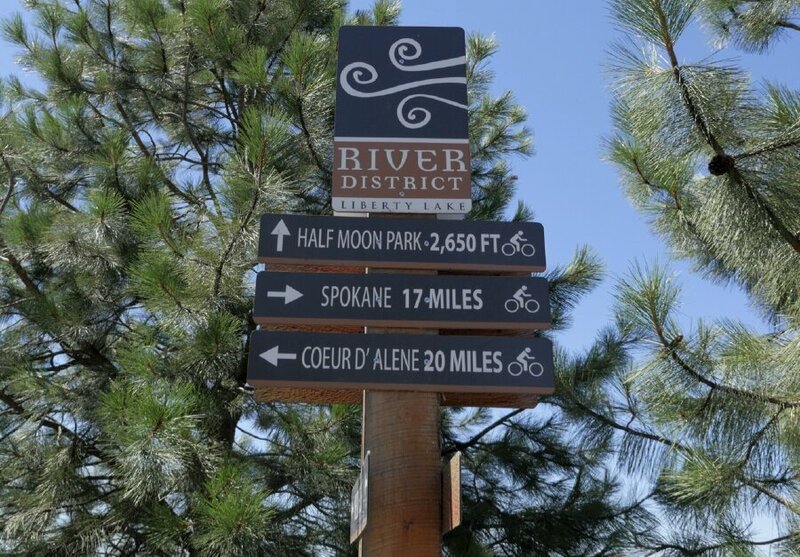 DAY 2: After breakfast, we hop directly onto the Spokane River Centennial Trail and follow the river to the Idaho state line where we’ll stop for lunch. 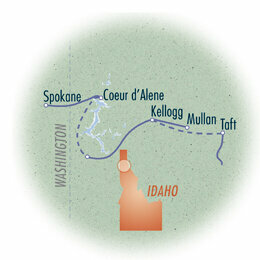 We’ll cross a diverse urban and rural landscape, before reaching the resort town of Coeur d’Alene. Named by French traders in reference to the tough trading practices of the local Indian tribes, it’s known today as the picturesque outdoor playground for the Pacific Northwest. 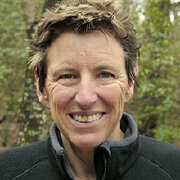 In the late afternoon, our guides will conduct a “Techniques for Better Bicycling” workshop. They’ll go over efficient pedaling and shifting practices, benefits of proper equipment and clothing, and how to change a flat tire. 22 or 39 miles. DAY 3: A short morning shuttle after breakfast takes us to our second bike path of the tour. 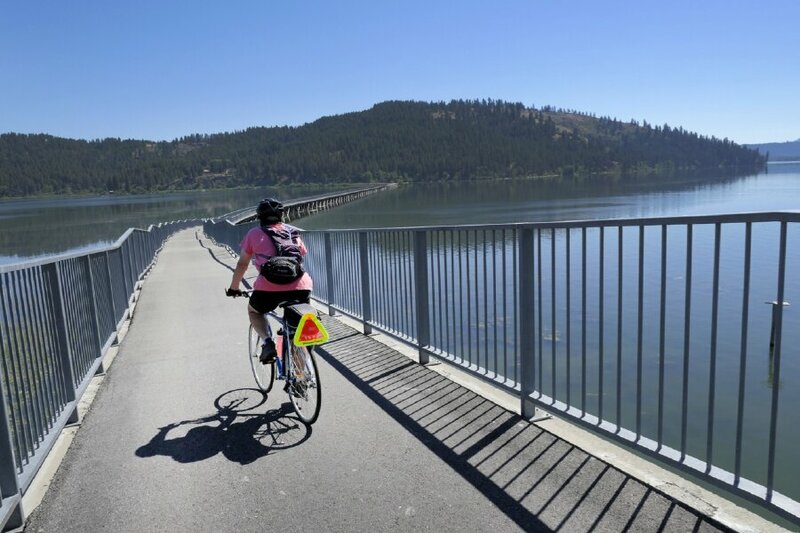 The beautiful Trail of the Coeur d’Alenes was established from an abandoned Union Pacific railroad bed. 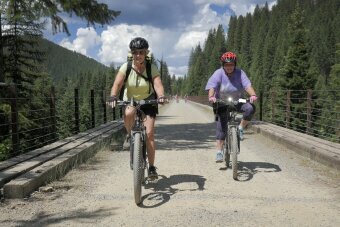 The paved trail winds for miles through wilderness filled with white pine forests and aspen glens. 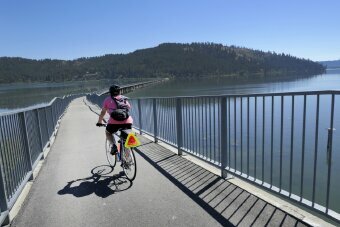 You’ll bike along the Coeur d’Alene River and Lake, past mountain creeks, marshy swamplands and fields of wildflowers. Keep your eyes peered for nesting eagles, or roving deer, elk and moose. There are neither services nor motorized vehicles along our route, so we’ll provide you with a picnic lunch on the trail before you make your way to our overnight destination -- the Morningstar Lodge. You can unpack your bags, as we’ll stay here at this beautiful resort for the next three nights. 26 or 54 miles. DAY 4: We’ll finish our ride on the Trail of the Coeur d’Alenes by biking to its end in the town of Mullan near the Montana border. We’ll loop back home by way of the historic mining town of Wallace for lunch. Wallace has long been known as the “Silver Capital of the World.” All of its downtown buildings are registered in the National Register of Historic Places. Be sure to make a visit to the fascinating Oasis Bordello Museum before heading out of town. 38 miles. DAY 5: A short morning shuttle takes us to our last bike path of the tour, but undoubtedly the most beautiful. The unpaved Hiawatha Rail Trail follows the former tracks of what was once known as the most scenic stretch of railroad in the country. It winds through nine tunnels and over seven trestles. You’ll have the choice of biking it in both directions, or taking the shuttle back to the start. Back at our resort, we’ll enjoy our last dinner together. 15 or 30 miles. DAY 6: After breakfast, we’ll shuttle back to the tour start in Spokane and say our good-byes. You can expect to be at the airport or train station by 10:30am to make your trip back home. 0 miles.